Haven’t had a chance to make it to the village yet? Well join us for this off road walk, taking the public bridleway around the airfield. Along the way we will be looking at some of the edible and interesting plants in the hedgerows. 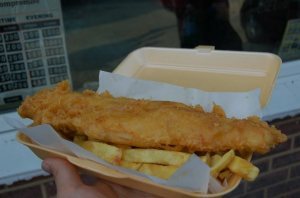 Once at the village you can buy the classic British special of fish & chips (or Indian or Chinese takeaway). You will then have the option of going for a pint at one of the village pubs or returning directly to the University. Note: the return journey will be done in the dark if attending the pub. This entry was posted in Blog, Local walk, News, Past events, Walks and tagged chips, Cranfield, fauna, fish, fish & chips, Fish and chips, flora, pub, village.